Samsung has launched a pair of mid range smartphones joining its popular Galaxy A-Series. 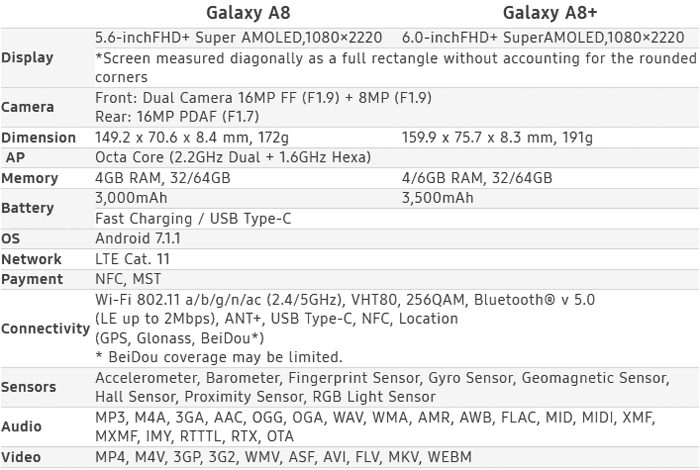 The Galaxy A8(2018) and A8+(2018) both share features such as a Dual Front Camera system, a large AMOLED Infinity Display, and ergonomic design drawn from the firm’s flagship handsets. Junho Park, VP of Global Product Planning at Samsung Mobile, suggested that the new designs deliver features that were found to be ‘customer favourites’ in market research. Its interesting that a dual front camera system would be preferred over a dual back camera system and its all down to selfies, of course. The Galaxy A8 smartphones employ a 16MP+8MP f/1.9 Dual Front Camera, for easy framing switching – one is adept at close-ups and the other at capturing you, your friends and the scene behind you. Users can use Samsung’s ‘Live Focus’ feature to adjust the background bokeh effect before or after you take the picture. The rear camera is a 16MP f/1.7 unit with PDAF. Both camera systems offer good performance, even in low light, says Samsung. For video recording Samsung includes DVis image stabilisation tech, and a time-lapse video function. It seems that none of the cameras include OIS. 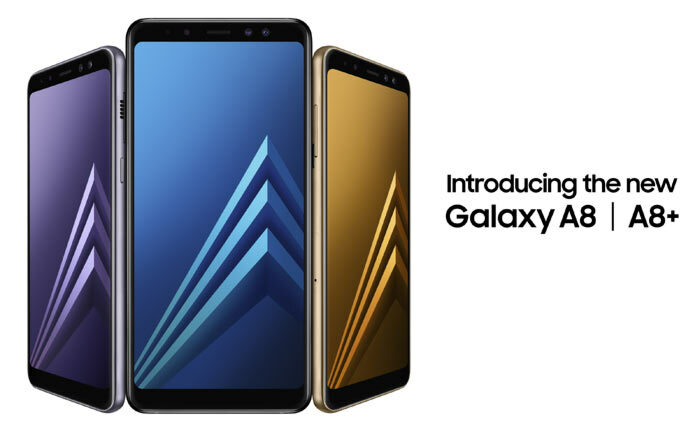 Another major attraction with the Galaxy A8(2018) and A8+(2018) smartphones are the displays. They measure 5.5- and 6.0-inches in diagonal, respectively. Both are Samsung SuperAMOLED displays with 1080 x 2220 pixels, described as an “immersive 18.5:9 display ratio”. Curved glass back and front and a metal frame make these phones smooth and comfortable in the hand. Samsung will make these A8 models available in black, orchid grey, gold and blue. 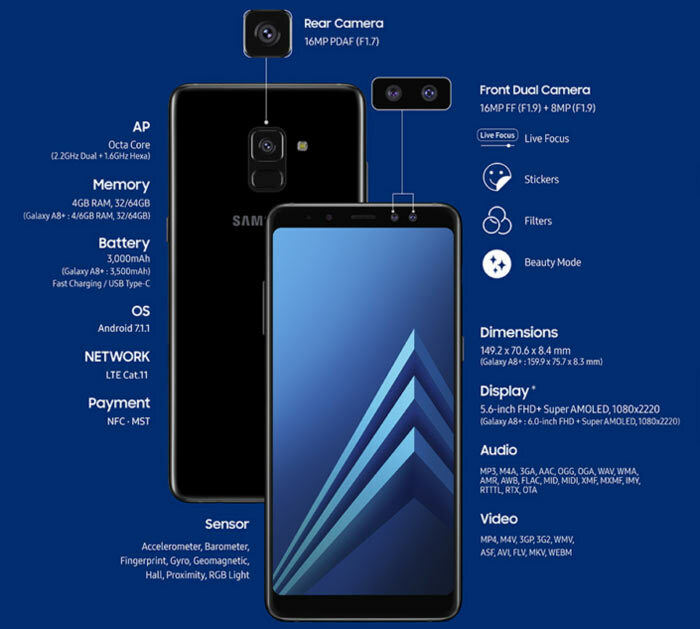 Further attractive features delivered by these new A8 designs include; always on display functionality, Samsung Pay, Finger print sensor, IP68 water and dust resistance, fast charging/USB Type-C, Octa Core (2.2GHz Dual + 1.6GHz Hexa) processing, at least 4GB of RAM, a choice of 32/64GB of storage (plus microSD card support up to 256GB), LTE Cat 11 networking, and Android 7.1.1 out of the box. Samsung hasn’t indicated any pricing but in an email to HEXUS said we will see them on sale in the UK from April in a choice of three colours. Some regions will get their hands on the new Galaxy A8 phones as early as January, and in a choice of four colours. Today Samsung announced that it has begun mass producing the industry’s first 2nd-generation of 10-nanometer class, 8-gigabit DDR4 DRAM. The advance delivers “the highest performance and energy efficiency for an 8Gb DRAM chip, as well as the smallest dimensions”. End users should expect performance levels and energy efficiency to offer improvements of approx 10 and 15 per cent respectively with these new DDR4 chips. Samsung says that the new 8Gb DDR4 can operate at 3,600Mbps per pin, compared to 3,200Mbps of the company’s first gen 10-nanometer class 8Gb DDR4. Interestingly ,Samsung says that the new DRAM makes use of “a unique air spacer that has been placed around its bit lines to dramatically decrease parasitic capacitance”. It hopes that the same or similar tech can be used in accelerating its plans for "much faster introductions" of next-generation DRAM chips and systems including DDR5, HBM3, LPDDR5 and GDDR6. So Samsung is now effectively selling air…. I believe some celebs sell their farts.